Emily made her resolution to lose weight in January 2010. 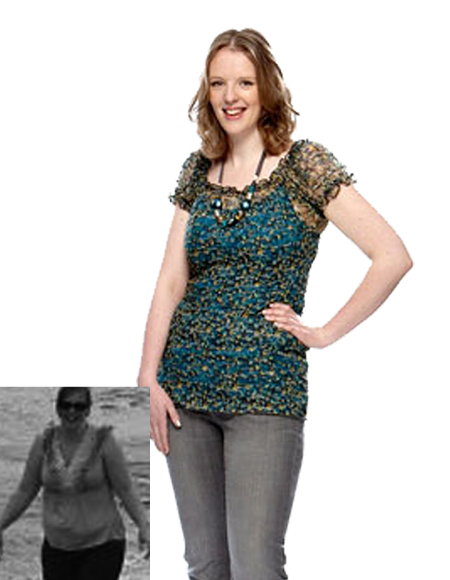 12 months later she had lost 4st56lbs25.4kg and reached her goal, dropping from a dress size 20 to a size 12. Emily has been successfully maintaining her new weight since 2011. What was the trigger that made you decide to lose weight? I decided to lose weight in January as a resolution. I'd been shopping for a New Year's Eve dress and couldn't find anything that looked good on me. I felt utterly depressed. Everything in moderation. I still have the occasional chocolate bar or piece of cake as a treat, but in much smaller portions! I've learnt to make healthy choices. I make meals from scratch so I know exactly what goes into the food I eat. I really think about what I eat and drink now. I didn't realise how many calories and how much sugar was in drinks I consumed regularly. Once I figured out how to pick the right foods and I became more active, it became easy to manage. It all seems so simple now! Eat lots of good foods, and a few bad things, and get moving! Get active! I exercise 2-3 times a week at a friendly local gym that runs fun dance and aerobic classes. It's an excellent way to relieve stress and socialise with people who have the same goals as you! Bad days or weeks do happen when you make no progress or take a step back, but keep your goal in mind and persevere. The end result will make all your hard work worth it! I plan the day ahead so I can make healthy choices. I carry snacks such as fruit, raisins or a granola bar with me for the times I get peckish. If I'm eating out, I'll try to make good food choices. When you're prepared, it becomes very easy to fit the diet into your everyday life. Fitting into a size 12 dress for the first time in a long while was FAB-U-LOUS! I guess my biggest milestone is yet to come. It will be this New Year's Eve, a year on from when I felt my worst to this year when I know I will be feeling my absolute best! Happy, healthy, content and a little bit hyper. I'm glad to be me! I look back at old photos and remind myself how much better I feel and look now. It's the best motivation in the world! Losing this weight has really changed my lifestyle for the better. I'm even rethinking my career goals! I feel happy, healthy, content and a little bit hyper! 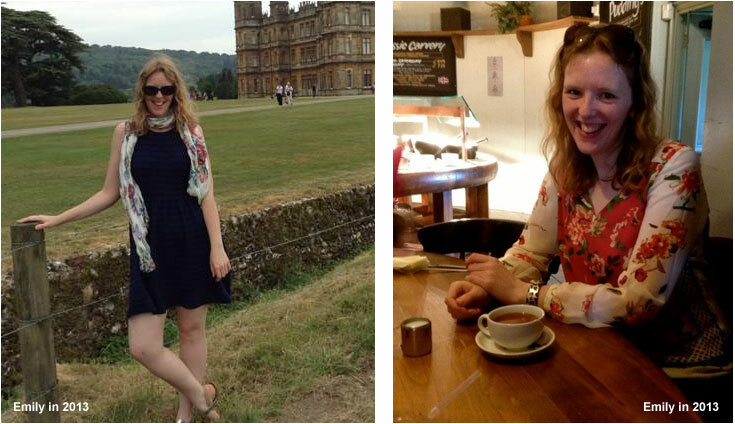 It is now three years on since Emily reached her goal weight. We caught up with her to ask how she is getting on and her tips for maintaining a healthy weight. How are you finding maintenance general? Maintenance can be hard work, I have found I need to continue making an effort to eat healthier foods and be active, however it's worth the effort I'm in the best shape of my life and looking forward to the future! How often do you weigh yourself? Do you still record this in your Weight Tracker? I try not to weigh myself every day, as I know my weight can fluctuate daily so I have an "Official Weigh In" once a week which I then record in my Weight Tracker on the website. It tends to be up to 5lbs. This is my 'threshold' - if my weight hits this upper limit, it's a warning be careful about my diet again. What do you do if you've gained a few pounds? If my trousers are feeling a bit tight, I'll be more strict with my diet and do longer sessions at the gym. What are your 3 top tips for someone who has just hit their goal? Don't go crazy thinking you no longer have to be careful with what you eat and drink, because you will regain weight! Continue the healthy eating habits you have created, but allow yourself the odd treat or cheat! Reward yourself for achieving your goal (or even better get someone else to), I'm going on holiday to the States and this is keeping me motivated to maintain my weight and look great this summer!